To ensure that no stone is left unturned in the search for a Super Rugby revival, the AOR team debates which former SA legends should immediately be appointed to coach the four franchises. Only the Stormers have scored fewer tries, and the men from Pretoria are also mighty low on carries and passes. So bring in an attack wizard, you say? Nope! On 15, they have conceded the second most scrum penalties in the comp! The current Bulls game plan simply cannot afford that sort of tourniquet round their source of ball. Bring in “Drieman”! On 133, the Jozi Jollers have made the 2nd most handling errors in the comp, but instead of treating the symptom, I say pull in a man who will change the fact that they have only put boot to ball 133 times this year, the third lowest in the comp! Kick a bit more, run a little less, make fewer errors. He might also improve on the 11 missed conversions. On 4,785m gained via the boot (2nd highest in the comp), the Banana boys certainly know how to get into the opposition half. And while having made just 828 tackles (14th) as they defend to get the ball back, they are also 14th on the missed tackles list (108)! Bring in the Bok known to have been the best organiser of a defence in the game. The Mountain Goats have scored the least tries (16), and scored the 2nd fewest points (163). Finishing is clearly an issue, but I might look a little closer to the source. The Stormers have conceded the most turnovers (119), and ruck penalties (13) in 2019. Bring in the fellow who’s fingers prove how valuable the ball was to the Boks in his era. The Bulls scored eight tries to demolish the Chiefs in the 2009 Super Rugby final, but have crossed the line just 18 times during the first nine rounds of the 2019 season. Habana is South Africa’s most prolific try-scorer in Super Rugby history with a tally of 56 only four shy of the all-time leader, Israel Folau. The sting in the tail of the team that hoisted the trophy in 2007 and 2009, Habana’s appointment as head coach would ensure the Bulls understand the ingredients required for dishing up a surfeit of tries. Only four teams have missed more tackles than the Lions, an impressive feat when you consider that only three teams have kicked less… pffft! One cat that wouldn’t find that funny is Ricky Januarie. A nano-back with the density of a tenpin bowling ball and the unnerving intensity of a bull terrier, Januarie’s value in defence and his commitment to the kicking game saw him poached by the Stormers from the Lions in 2008. Joubert is the closest thing to a Jedi Knight that rugby has ever produced, and that’s exactly what is needed at Kings Park right now – an experienced fullback who knows when the time is right to switch on his laser stick. While the Sharks have gained the second-most kicking metres in the comp, they’ve only been asked to make the second-fewest tackles. This means rival teams are kicking the pill back to the coastal cruisers, and they need Jouba at training in cargo shorts and flip flops to teach them when to run and when to hit grass. During the first decade of his career, Schalk Burger was all over the breakdown like a Bull in a braai shop. The Stormers could use some guidance from the only South African capable of rivalling Richie McCaw’s reputation as a loose forward – they’ve conceded the most ruck penalties and turnovers, and are ranked ninth for turnovers won. If Burger was reunited with his ivory-white, leather single-seater in the team room, the Stormers would reclaim ruck control. 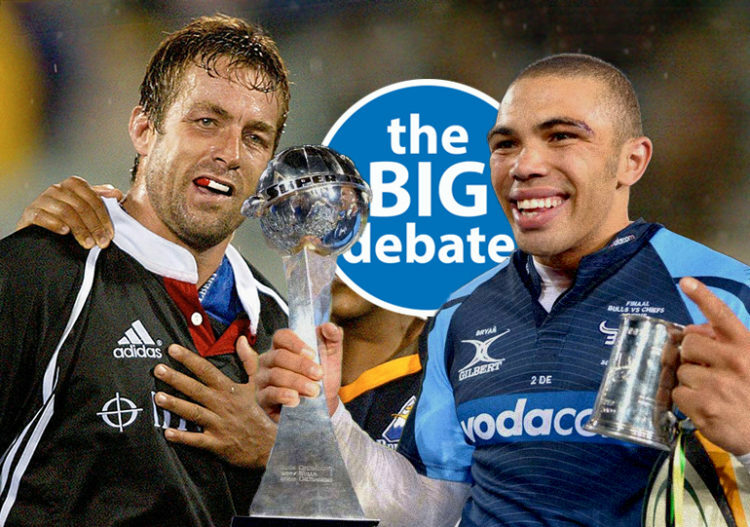 OK, so you’ve read what they think, now let us know where you stand in The Big Debate! At least Zelim picked players that played for those teams Tank basically thinks the ex stormers can coach everyone. While we’re at it, why don’t we make some Ref’s couches too ? They also spend a lot of time on Rugby fields don’t they. Everyone talks about NZ’s player management, but I think the real secret sauce is how they develop their coaches. Being a former player/buddy means nothing to them. If you don’t win tournaments, you don’t progress to top tier teams as a coach. And the NZ way IS the only way. Earn your stripes in coaching pedigree. SA is light-years behind and will remain so until the management is changed. I think first of all there is succession planning and secondly the New Zealanders persevere. The only one I can think of who has been an abysmal failure is Umaga. Still they have not thrown him on the rubbish heap by letting him stay on in another role. Oh, and that chap Feeney, perhaps? Sorry to say that I disagree with both selections! It is not that they were not good players, but as ever we just assume that good players must naturally become good coaches! That logic, as in any management function, simply does not carry! Du Preez and Fleck we’re both good players…..
How many Springbok coaches have we appointed, based on a bit of form at a lower level and with little else. No psychometric testing, no dynamism analysis, no measurement of strategic thinking, man management and so on! We expect nothing other than professionalism from our players, yet when it comes to appointing coaches and specialist, we just take a generalist dip and hope for the best! Some of our greatest coaches were never Springboks or even top Provincial players – take Jake White for instance. He’s just strategically smart, has good man management abilities and as a teacher has the ability to communicate to players in a way that they understand the plan and what is expected! My thoughts exactly. a good player does not necessarily make a good coach. Even a good analyst will not always make a good coach. Progression should be what it is all about. Start as an assistant coach at a primary school and move from there. You will probably not coach the Boks at 35, but you shouldn’t anyway, unless you started at 15. Fourie du Preez. There’s no better rugby brain in SA than him. Some of our best coaches are overseas. Bring back Dawie Theron and Owen Mounemaine. Get Jake White, Nick Mallet, Heyneke Meyer, Os du Randt, Eugene Eloff and Alan Solomons involved. Mallet simply doesn’t have the patience anymore. He was a harsh coach who did not tolerate dissent or weakness. I don’t think that at the age of 62, he would last a month with any of our sides. Heynecke Meyer is, like our beloved Rassie, simply too pattern-oriented. They believe that SA players can’t play a running game. They believe that the pattern should be built around a box kicking scrumhalf. Unfortunately, we only had two very good ones: Fourie du Preez and Johan Roux. In Roux’s case, Kitch Christie decided on Joost as No 1, because even though he was not the best scrumhalf, he was an outstanding rugby player. So, Joost could not kick and Christie simply picked a kicking flyhalf in Stransky. Rassie cannot adapt. He tried to make a box kicker out of Faf and when that did not work, he dropped him. So did Coetzee. Meyer went as far as picking Schreuder, because he kicked. The fact that he did it poorly and the rest of his play was poor, did not matter. He was used to kicking and therefore he was picked. That is not the hallmark of a good coach. A good coach should know: If a player does not know how to do something, he simply can’t do it. You should build your game plan around the ability of your best available players, not pick players that fit your preconceived game plan. Finally someone who knows what he’s talking about, well done Whynger. Both the coach and captain must have all the attributes of natural born leaders with a game plan and rugby smarts to match. Regrettably these are and have been in short supply in sunny SA for a very long time now and this year apparently even more so. Rassie must surely be scratching his head at the mediocrity of our SR challenge so far, so good luck to him picking a WC winning side from that lot, lol.. Cheers.